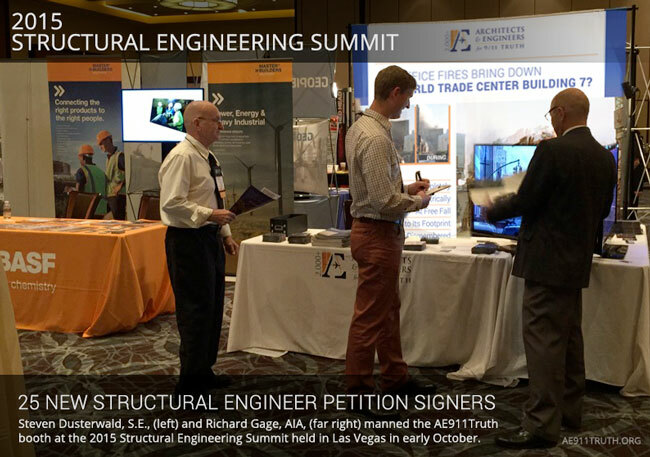 25 New Structural Engineer Petition Signers! Well, we made it! Our fiercely dedicated AE911Truth supporters raised the necessary the funds to send structural engineer Steven Dusterwald, S.E., and architect Richard Gage, AIA, to the 400-strong NCSEA Structural Engineering Summit in Las Vegas earlier this month. And once there, we made quite a stir! Thanks to our backers, we hosted a first-class exhibit booth that attracted many curious convention-goers. Throughout the two days we participated in this three-day event, more than 100 structural engineers saw the evidence we presented demonstrating the controlled demolition of World Trade Center Building 7. Of those we engaged in conversation, 25 of them signed our petition demanding a new investigation. How did we get such a high percentage to stop by our booth and sign on the dotted line? As attendees walked past, we asked: "Did you know a third tower came down on 9/11?" Hearing that question more than 14 years after the tragic event had become a dim, distant memory in their minds, they generally stopped dead in their tracks and, with a puzzled look, asked, "What?!" "Yeah," we responded, pointing to the looping video on our TV monitor. "Look at Building 7. How is it coming down? Did fire cause it to fall that way? Or is that a controlled demolition?" Most of them replied matter-of-factly: "Controlled demolition." Our next line: "NIST says 'normal office fires.' But fire has never brought down a steel-framed skyscraper — and no plane hit this building. Would you like to join the 2,350 architects and engineers who are calling for a new independent investigation?"